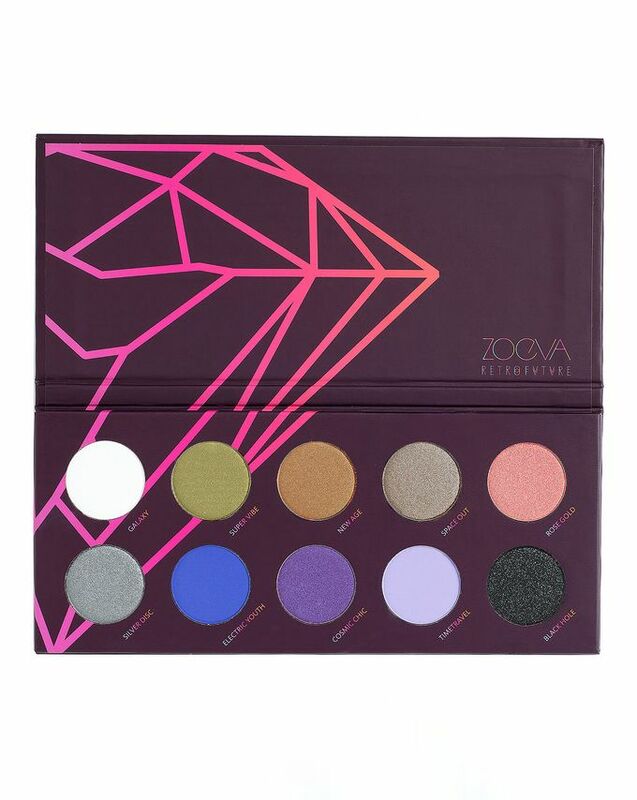 Get intergalactic inspired with ZOEVA’s statement Retro Future eye palette, inspired by the bold hues of the planets. Comprising an array of 10 covetable shades in matte, shimmering and sparkling textures – adorn your lids with indigo, electric blue and silver and add definition with sparkly black. These formulas blend together like a dream and used with ZOEVA’s multitude of high-tech brushes, you can create showstopping eyes in an instant. 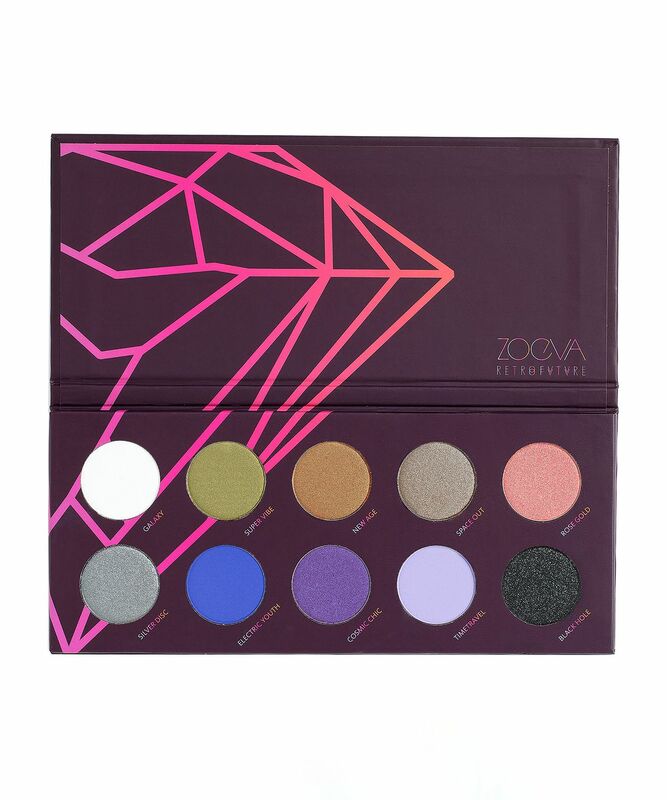 ZOEVA’s products and tools are beloved by professionals and make up devotees alike, each one delivering a flawless finish so you can master even the trickiest of make up techniques. This gorgeous Retro Future eye palette is a case in point – use the gold, silver and butterscotch shades (‘Space Out’, ‘Silver Disc’, ‘Super Vibe’) for a statement daytime look, or add a touch of drama in glittery black, indigo and deep blue (‘Black Hole’, ‘Cosmic Chic’ and ‘Electric Youth’) among other stand-out hues. Free from parabens and mineral oil, the formulas contain micronised pigments for an incredibly rich colour payoff. Silver Disc, Cosmic Chic, Timetravel: Mica, Talc, Magnesium Stearate, Octyldodecyl Stearoyl Stearate, C12-15 Alkyl Benzoate, Dimethicone, Nylon 12, Phenoxyethanol, Dimethiconol, Tocopheryl Acetate, Dehydroacetic Acid, [+/- CI 77491 (Iron Oxide), CI 77492 (Iron Oxide), CI 77499 (Iron Oxide), CI 19140 (Yellow 5 Lake), CI 77891 (Titanium Dioxide)]. // Super Vibe, Galaxy: Talc, Zinc Stearate, Mica, Octyldodecyl Stearoyl Stearate, Polybutene, Octyldodecanol, Phenoxyethanol, Tocopheryl Acetate, Lauroyl Lysine, Dehydroacetic Acid, [+/- CI 77891 (Titanium Dioxide), CI 77007 (Ultramarines), CI 75470 (Carmine)]. // Space Out: Mica, Talc, Magnesium Stearate, Octyldodecyl Stearoyl Stearate, C12-15 Alkyl Benzoate, Dimethicone, Nylon 12, Phenoxyethanol, Cobalt Titanium Oxide, Dimethiconol, Tocopheryl Acetate, Dehydroacetic Acid, CI 77891 (Titanium Dioxide), CI 77491 (Iron Oxide), CI 77499 (Iron Oxide), CI 77492 (Iron Oxide). // New Age: Mica, Octyldodecyl Stearoyl Stearate, C12-15 Alkyl Benzoate, Dimethicone, Talc, Magnesium Stearate, Nylon 12, Dimethiconol, Phenoxyethanol, Tocopheryl Acetate, Dehydroacetic Acid, CI 77742 (Manganese Violet), CI 77891 (Titanium Dioxide), CI 77510 (Ferric Ferrocyanide). // Rose Gold: Mica, Magnesium Stearate, Octyldodecyl Stearoyl Stearate, C12-15 Alkyl Benzoate, Talc, Dimethicone, Nylon 12, Dimethiconol, Phenoxyethanol, Tocopheryl Acetate, Dehydroacetic Acid, CI 77891 (Titanium Dioxide), CI 75470 (Carmine), CI 16035 (Red 40 Lake). // Electric Youth: Talc, Aluminum Starch Octenylsuccinate, Magnesium Stearate, Mica, Caprylic/Capric Triglyceride, Dimethicone, Phenoxyethanol, Dimethiconol, Tocopheryl Acetate, Dehydroacetic Acid, Cera Alba, CI 77007 (Ultramarines), CI 75470 (Carmine), CI 77510 (Ferric Ferrocyanide). // Black Hole: Talc, Zea Mays Starch, Calcium Aluminum Borosilicate, Octyldodecyl Stearoyl Stearate, Isopropyl Lanolate, Silica, Zinc Stearate, Phenoxyethanol, Tocopheryl Acetate, Cyclopentasiloxane, Dehydroacetic Acid, Dimethicone, Dimethiconol, CI 77499 (Iron Oxide), CI 77891 (Titanium Dioxide).